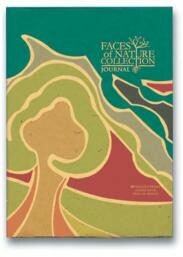 The Faces of Nature is an ode to the sacred spirituality that nature exuberates. A state of grace or simply being, it's where the rest of nature resides. We're witness to it every time we see a flower's emergence. Its lovely, natural unfolding that takes place before us. There is no struggle or effort, it just happens. This Mango Paper journal is made with our tree free organic papers. These post consumer tree free paper journals are excellent for personal notes, ideas, documenting your travel and plans for the garden all can be written in your journal. These tree free paper journal includes 80 blank pages of tree less paper. Our tree free paper journals include Banana, Coffee and Mango Paper. Made in Costa Rica from post-consumer waste and plantation agricultural - waste fibers.